You can rely on Antique Rug Co for professional and proper area rug cleaning of handmade Persian, Navajo and Oriental rugs as well as custom and mechanicals. We are not a rug cleaner but here is why cleaning with us will result in best cleaning in town. When compared to the process at a rug cleaner we add extra layers of quality control to the cleaning of your valuable rugs. There are many rug cleaners. We work only with the best cleaning plants in town. Not every plant washes the same way. We inspect, write instructions and assign the cleaner best for the type of rug and its needs. We also inspect every rug after it’s been cleaned and if necessary recommend re-wash if we feel a second cleaning is beneficial. 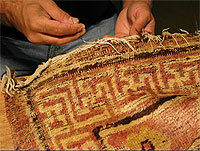 The methods of cleaning handmade area, Persian, Navajo and Oriental rugs are generally similar but vary in detail. We at Antique Rug Company choose the rug cleaner with the proper method suitable for the rug at hand, catering to the particular needs of each individual rug. Among issues to consider are condition, pile fiber content, dyes, foundation type and weaving type of the rug. Our vast experience ensures a proper servicing of your valuable rugs each and every time. Please feel free to contact us with any specific concerns you may have. Examine every rug to determine the appropriate cleaning process, choose the cleaner best for the rug type and its needs, write instructions and notes to pay attention during cleaning process. Most Important – Dust rugs prior to washing using the most current methods available today. Deep dustingis an essential step in the cleaning process and is not included at cleaners offering on-site cleaning, dry cleaning, steam cleaning and other non-water immersion cleaning services. Every rug is Hand washed.